When people think of Washington DC, they picture the majesty and history of the National Mall. Every iconic image of the nation's capital is framed on this sacred national park, from the Lincoln Memorial and Washington Monument. Stroll through the massive green space - from the Potomac River to the US Capitol Building - which protects our nation's most symbolic monuments and memorials. Tour the mall, enjoy a picnic on the lawn and ponder American freedom and history in the reflecting pools. The National Mall in Washington DC is a true national treasure. What can I see and do at the National Mall? 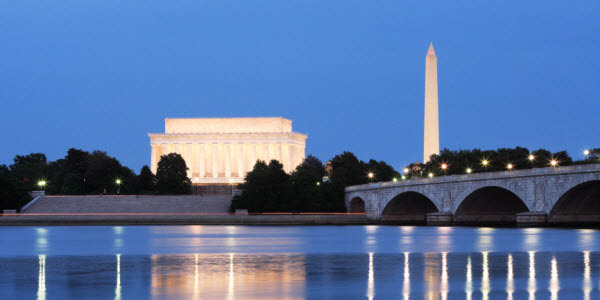 The National Mall protects the country’s most iconic monuments and memorials, including the Jefferson Memorial, Washington Monument, Lincoln Memorial and WWII Memorial. Join a ranger-led walking or bike tour to experience these majestic landmarks that symbolize the spirit of America. The National Mall and Memorial Parks safeguards 1,000 acres of parkland in Washington, DC, and encompasses 80 historic sites and 150 historic parks and squares, including the East Potomac Park and Constitution Gardens. See the Jefferson Memorial and Japanese Cherry Trees from on Tidal Basin Paddle Boats. Are there guided tours and ranger programs? Yes. Park rangers offer fun guided programs and activities that help you discover and learn about the National Mall. Join ranger-led talks, walks, runs, and bike rides - always free of charge. Join the Memorials at Night walk and marvel at the monuments illuminating under the night sky. Why Stay at The River Inn?